A picture I took of Koko. My story started a long while back, so long that my memories of it are a bit fuzzy. I remember that one day, me and my sister were jumping around with excitement for the arrival of what would be our first budgies. I also remember that the cage they came in was in pretty bad shape and we actually used that awful bird sandpaper for their cage’s lining for a bit, which I remember hating even at that age. Besides that, I remember how fun it was to just watch them go about chirping and going back and forth, being so energetic all the time. My budgie was a very bright blue little guy, I can’t remember if he was definitely a male or not, but I ended up naming him Charlie. The other budgie that came with him was named Koko, who would end up living with us for the next 9 years. They were really fun to have around, but not too long after getting them my budgie Charlie seemed to be acting oddly. I recall pointing this out to my parents, but not long after noticing this I found my dear Charlie lying still on the floor of his cage. I remember crying a lot that day. He was really special to me. After Charlie’s death, my parents decided to get me another budgie to try to cheer me up. This one was almost the same color as Charlie. He must have been younger than Charlie though, because he had a very vibrant color and pattern to his feathers. We named him Mikey. I remember Koko being very inactive during this time; I guess it was because she wasn’t ready for another partner yet. Even though Mikey was ignored by Koko most of the time, he really opened up to us and turned out to be really tame. His favorite perch was on a telescope toy that was on top of a little Barbie house we had in our living room. He also liked climbing around our shoulders and sitting beside our ears where he liked to nibble on them. 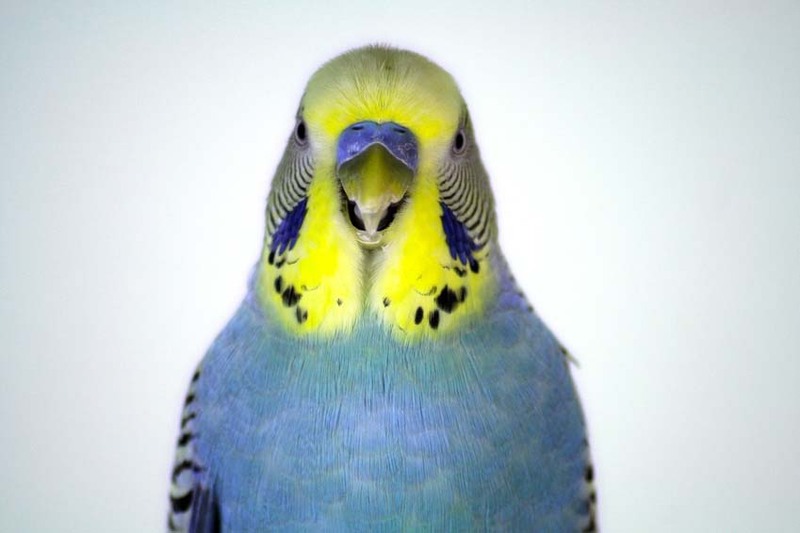 He was really a joy to have around, like most budgies are. During the time we had Mikey and Koko, my brother got a pair of birds of his own. He ended up getting a type of brown finch, I’m pretty sure they are called black hooded nun finches. He named one Chloe, and the other Bird. They were a cute little pair, and liked to sing and preen each other. I remember one Christmas we came back home and couldn’t find them in their cage, but we heard them peeping. When we tried following their peeping, we couldn’t see them. Then someone noticed that they were hiding in our Christmas tree. Everybody had a good laugh at that. Bird and Chloe lived happily for a long time, until one day when we found out that Bird had passed away. For a long time, Chloe was very depressed and her health started to decline. We tried to keep her happy, but nothing worked. We decided that we should try to find her some company. 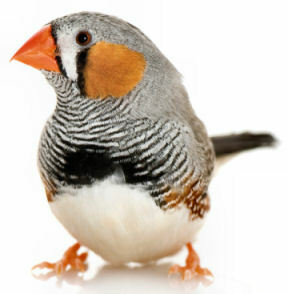 Then one day we found a little zebra finch whom we named Rosie. I’m pretty sure that he was a boy, but since he had such bright cheeks, we thought that Rosie was a suitable name. He got along okay with Chloe, but she continued to get worse and passed away suddenly. Rosie then went through the same thing that happened to Chloe, and we didn’t know what to do. We didn’t want to get another finch after what happened to the others, so we couldn’t do much. My brother had already started neglecting them, and since I was so young I didn’t have any control over what would happen. Rosie eventually passed away, but I don’t remember how. If I knew what better solutions were possible like now, we could have prevented this from happening. Our birds could have been a lot healthier, but we didn’t have the knowledge or experience at that time that we needed to take care of them properly. Our family was one of those typical, uneducated ones that just didn’t have the right information about taking care of exotic pets like these birds. It was nearly a year after this that we lost Mikey. The birds were out and having a good time when my Mom landed home from work. When she went to open the door, we yelled for her not to but before we could do anything; Mikey had flown out the door. I was mad with my mother for a while, but I now know that it wasn’t her fault. She couldn’t have known that Mikey was out unless we would have warned her before hand. I’m pretty sure that we looked for Mikey for a while, but we were surrounded by trees which made it really difficult for us to find him. We never did end up finding him, but I can still remember how much fun he was to have around. This incident was yet another lesson that I would learn about keeping birds, and how it is dangerous to not have any two-door barrier to keep your birds inside and safe. Koko was still a very lonely bird around this time. She had no company and still wouldn’t come near us. My parents surprised me one day with yet another budgie, who came with the name Mickey. He was an albino budgie. I can remember this because he had red eyes and an all white body. Mickey was really cute, but instead of getting along with Koko, he was just as grumpy as her and stayed at a distance from everybody. I still liked having Mickey as a pet, but everyone else didn’t like him all that well. Mickey was an older bird, and he didn’t like being bothered. I still tried to be nice to him though, and I was determined to tame him. Mickey was with us for a long time. One weekend when we were away, we came back to Koko being loose and Mickey no where in sight. Their cage was on the floor, and we heard Koko chirping downstairs somewhere. I carefully rushed around the house hoping to find Mickey, but I didn’t find any trace of him. We were just giving up hope when my sister started yelling about something under the bed. She had found a clump of poor Mickey’s feathers. We all thought that he was eaten by one of the cats. I still didn’t give up though. Later my parents finally told me to stop and convinced me that Mickey was gone. This wouldn’t have happened if the cats got inside though, they must have got in when our neighbor came over to feed the animals. I didn’t really want another budgie after this, but my younger sister did. She ended up getting another budgie, who we all named Bubbles. Bubbles was a female recessive pied budgie. She had blue and gray markings, and was a bit smaller than Koko. They didn’t get along well with each other, and sometimes fought. Bubbles was innocent most of the time but Koko just wanted to be left alone. I know realize that this issue was most likely caused by the lack of their own personal spaces inside those small cages I used to keep them in. After a while, I noticed that we had neglected the budgies too much, and I got fed up with it. I took responsibility of the budgies as well as I could, and started to research on my own. I started with some books of basic care then I continued to research further on the Internet. This helped a bit, but my research was still limited since I was so young and barely had any experience with this type of thing. I learned how to properly clean their cages, where their cage location should be, what things in the household could harm them, what foods were bad for them and things of the like. Their condition improved gradually, and I started to get the hang of it. My knowledge was at a minimum at this point though, so I didn’t do all that great with their care. Things were still out of hand, but I kept learning more day after day and still am. I moved the budgies out of the kitchen. Now that I look back, I realize that the Teflon from the pans was probably why there were so many deaths. I didn’t exactly realize this at that moment, I just didn’t want another budgie to fly out the kitchen door nor get sick from the drafts coming through the doorway. I didn’t know about things like quarantine or the minimum cage size for budgies yet, so this can give you an idea of how much I knew back then. Maybe a few months later, I decided that I was ready to get another budgie. I even remember preparing the cage for his/her arrival. When I thought we had enough supplies ready for another flock member to enter the family, we set off to the pet store. (I know that pet stores are generally not the best place to get birds, but there aren’t any quality breeders around that I trust either.) There were budgies chirping, flapping, preening and playing everywhere in the cage they were being kept in. I was carefully watching the budgies like I read how you were supposed to; observing their behavior, how they interact with each other, their activity levels, etc. I was looking for a young, healthy budgie, and one that seemed to get along with the others. I finally made a decision, and we told the employee that was working there. The budgie I picked was a yellow-face budgie, with a sea foam-colored body. The employee was not very gentle with the budgie, flinging that net around the cage like a maniac, but I didn’t want to interrupt. I’m afraid that the majority of employees that I have met at pet stores have been inexperienced and untrustworthy, but of those, a few have been pretty nice. Once the worker caught the budgie, she took him to the back and instantly clipped him without even asking me. I didn’t really like the way she was handling him like that, but I didn’t have much control over what was happening. When he was safe in his little carrier box, and all the papers were signed, we headed back home. On our way back, we came up with the name Wheezy. (I personally didn’t like this, but it caught on after a little bit.) Wheezy was pretty quiet all the way home, and he seemed to be really scared. This didn’t surprise me though, considering what he just went through. When we got back home, I carefully set him in his cage. Just as soon as I put him in, he flapped wildly as hard as he could around the cage. I was scared that he was going to hurt himself by doing this, but he calmed down after a bit. I kept watching him and made sure he didn’t have another panic attack, then I decided it was time to go to sleep. When I went down the next morning, I was so excited to see him again. I skipped all the way down the stairs and into the room. When I uncovered his cage, my heart skipped a few beats. I found Wheezy frozen still on the ground, and I immediately started to tear up. I gently picked him up to bring him out, and carefully set him on the table. I just stared at him for a few minutes because I was so devastated. Then I bolted upstairs to tell my parents. I couldn’t bear to see him again like that, but I insisted on burying him myself. Later I held a little ceremony in memory of him before his burial, and I prayed for a bit. When I finished packing the soil where he was buried, I constructed a little cross for him and put it on top. I only had Wheezy for a night, but he still touched my heart like every other animal we owned. I couldn’t believe the bad luck I was having with all of my previous birds, I already had owned 4 budgies but I wasn’t going to give up. Since pet insurance came with Wheezy, we were allowed to get another budgie for free from the same store. My Dad brought me back once again so that I could get another budgie. There were still lots of budgies at the store, but there were less than there were two days ago. I observed the budgies once more, looking carefully at the different behaviors and personalities of each one. I chose one that suited what I was looking for, and I got my Dad to tell the worker to get him ready for us. Meanwhile, I noticed that the very same budgie that I wanted was hanging around another female budgie. They were preening each other very happily, and were comfortable with each other. Since they seemed to be attached, my father and I decided to bring them both home with us. Later I realized that this wasn’t a very good decision. We named the female Khloe, who became my younger sister’s 2nd budgie, and I named the male that I picked out Kasper. Khloe and Kasper survived way longer than Wheezy did, and I was relieved. I was so worried that the same thing would happen to them if we weren’t careful, but they were okay. Khloe turned out to be a skittish little budgie. She was bothered by my younger sister a lot along with Bubbles, and it was hard to control my sister because she would usually tell my father and he wouldn’t be too pleased. I tried my best though, and kept on researching. Bubbles, Koko, and Khloe didn’t get along that well because they were all females, so I had to be careful with who went in what cage at a time and who was let out for a fly. I kept Bubbles with Koko most of the time, and Kasper with Khloe. Koko and Bubbles got in worse fights, and I didn’t know what to do with them. I didn’t have an extra cage, or any experience with anything like this. Khloe wasn’t attached to Kasper like she used to be, and they started bickering over the smallest problems. I kept on researching, and this led me to bird forums and other useful sites that helped me a lot. I kept trying my best, but I couldn’t keep up. Then that one dreadful day came, the day we lost Khloe. I went off to school that day very happy, but when I came back home and checked on Khloe, she had passed away. I wasn’t sure what had happened, but now that I look back on it, I think that I may have accidentally starved her. She was under her food dish when I checked, and I had only changed their food that morning because I completely forgot that I hadn’t changed it in a day. I was dreadfully sad for a while, because I thought that it was my fault. Khloe was buried beside Wheezy, who she was the spitting image of. (Except that she was a duller blue color.) My sister was also terribly sad, but she got over it faster than me. After Khloe had passed away I decided to move Bubbles in with Kasper. This turned out to be a bad idea too because she didn’t like Kasper’s company either. Then after a bit, Koko started to cling to the cage wall closest to the other two and started chirping her head off. She wouldn’t stop unless I came over to calm her down. She kept this up for a long time, but I put an end to that by moving Kasper in with her. She still did it occasionally, but got over it when she actually got comfortable with Kasper. The rest was a bit of a blur for some reason. I can’t exactly put my finger on the chronological order of how things happened, but I can still remember a few things. I was still a beginner (Which I am still!) in birds, so I still didn’t do the best with certain things. For example, when Koko popped out an egg unexpectedly, I thought that the best thing to do was put a nestbox in with her, along with Kasper. Let’s just say that it was a good thing that they weren’t fertile! Kasper was too young, Koko was too old, and I was very inexperienced. I can’t believe how naïve I was back then, but it can’t be helped I guess. Sadly, Bubbles ended up becoming a stressed out budgie. She didn’t like coming in contact with humans, nor other budgies for some reason. She was a bit lonely, so I tried putting her in with Koko. They ended up getting in more fights again, so I had to put her in a cage all alone. Poor Bubbles was not doing well. One day Bubbles got out of her cage and got lost in the humongous mess that used to be in my room. She was in there for a whole night because it was nearly impossible to find her. When we finally got her the next day, I was relieved, but then I noticed how much she was sneezing. She inhaled so much dust that she was sneezing every few seconds. I didn’t think much of this considering how little I knew, but I still was a bit more careful with her. The next few days she seemed to be getting weaker, but one night I actually got a few last moments with her before I went to bed. The next day after school, I found Bubbles dead in her cage. I actually thought that things were looking up for her, but I was wrong. I guess that saying “You don’t know what you’ve got until it’s gone.” is true. Bubbles was such a sweet bird, but I didn’t realize this until she was gone. She was intelligent, curious, and adventurous. I wish I had realized this before. Khloe, Kasper, Bubbles and Koko. You already know how I got Koko and Kasper, but there is just one other bird that we are missing; Froot Loop. For a while I didn’t think that we should get another bird. Instead, I thought that it would be a better idea to invest in a bigger cage for Koko and Kasper. They were in separate cages because I was scared that they would get in fights without enough space, or that Kasper’s company would get Koko laying eggs again. I couldn’t keep them in there much longer, so we made plans that the next trip up to the city would be when we got a new cage. A few weeks later we finally got a chance to head to the city, so I brought my money with me and we took off. The pet store we went to was pretty huge, and there were a lot of different birds in there. Green Cheek Conures, Lovebirds, Budgies, Finches, African Greys, Canaries, you name it! There was such a massive amount of budgies; the store put a dang sale on them. I felt sorry for them, but I didn’t need another budgie so I had to walk away. The selection of cages was pretty vast too, and I actually ended up finding a great cage that was within budget. I asked my father about it, and a staff worker came to help us with our selection. She went out back and brought out what we wanted, and she said “So are you going to get a budgie with it too?” I wasn’t planning on this, but my Dad actually told me that it was okay to get one. He told me that my little sister wanted another one anyway, so he told me to pick one out. There were so many to pick from that I had a hard time choosing. I went for the more active males; ones that looked like they were social but not picking fights with other budgies. The one I picked ended up being very feisty. He was running around like mad when he figured out what was going on, but the worker got him. I’m not sure if she clipped his wings or if they were already clipped, but later she plopped him in a little safe box for on the way back home, and we were back on the road again. With a new cage and a new flock member. Froot Loop on his second day at home. After Froot Loop went through quarantine, and all three of them went to the vet; they were all united together in the new cage. The three of them got along really well. Kasper and Froot Loop preen each other occasionally, and Koko got a lot of attention; just the way she liked it. The three of them were fine for quite a long time after that. Always cheering me up with they crazy antics and adorable quirks. Until one Tuesday morning on July 5th, 2011. When I woke up I got out of bed very cheerfully, glad to see that the birds were up and about too. I walked over to where they were, and opened up the curtains to see the sun shining brightly. But when I looked back to the cage I noticed something on the bottom of the cage. It was Koko. Her eyes were closed, her body was stiff, and her feet were clenched. It was hard to look at her. I was shocked, I just stood there in silence for a few moments. I knew for sure that she was already gone. I ran upstairs in time to tell my sister and father the bad news, and then broke out in tears in the middle of the kitchen. Koko was just so special to me, it is hard to believe that she is gone. I’ll miss her so badly, especially when I spend time with the other two budgie boys. They kept going down on the bottom perch near her, getting closer, and being curious. My Dad helped me put her in a box, and about an hour later we decided to go bury her. We picked a spot beside Khloe’s grave, and after burying her we left a cross standing to mark her spot. I said a few prayers and started to cry, it was really hard saying good-bye to her. Koko was with us since the very beginning, nearly 9 years ago. She was our first bird, and she’ll always be in our hearts and minds. Fly Free Forever Koko, we’ll miss you along with all the other fids that we have lost. Kasper and Froot Loop are now one happy little flock of two, and that’s just the way I like it. Hopefully all of this researching and learning about birds will pay off soon and I will be able to take care of them even better.